Our World Time Clocks have dials that display the time zones for all major cities in the world. You rotate the Time Zone Dial to mark your location and then the dial will display the difference in hours from one time zone to another. We offer Howard Miller World Time Clocks, World time wall clocks and Seiko World Time Clocks. We also carry the Analog World Time Zone wall clocks with up to 5 dials. The Digital World Time Clocks offer LCD displays for quick view operation. 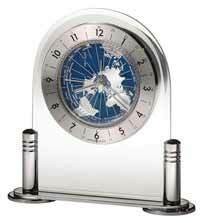 All World Time Clocks and Worldtime Clocks carry a one year warranty at The Clock Depot. This clever world-time clock can display time for all 24 world time zones. A titanium finished, sloped case with brushed aluminum finished front panel supports the two satin silver-finished dials. Rotate the polished chrome-finished airplane on the right dial to point at one of the 24 world cities and the clock hands on the left dial move to show local time for the selected city. The left dial features a silver-finished 24 hour ring that frames the black Arabic numerals, hour markers, minute track and hands, all beneath an acrylic crystal. One year warranty and Free Shipping. Size: Height 2" Width 6.75" Depth 4"
Howard Miller Photo Traveler Alarm Clock 645-571 slim folding travel alarm clock - photo frame clock makes this one the perfect picture frame clock for travel. Black and brushed silver finish. The LCD displays the month, day, and time in a 12- or 24-hour format. Dual time format, snooze alarm, and display light at a touch. Quartz, alarm movement includes the battery. 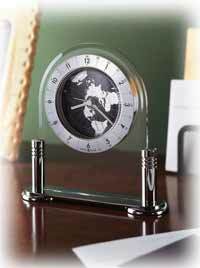 Size: H 3" W 2.75" D .75"
Slim, silver tone World Time Clock - alarm clock comes in a black leatherette case for traveling or can also be placed on a desk with the attached, folding stand. Use the pen to set the many features. 8-digit calculator with memory function. Choose the time from 16 major cities around the world. Handheld Currency converter and optional 24-hour display. Alarm movement offers 3 alarms: 1) daily alarm, 2) daily alarm that does not sound on Sunday, and 3) alarm that can be programmed for a future date and time. Quartz, alarm movement features snooze and includes battery. One year warranty and Free Shipping. 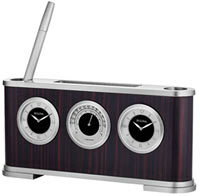 Size: H. 5" W. 4" D. 1"
This world time table alarm clock is a handsome beveled glass arch set in a satin Rosewood base. The dial features a circular spun brass finished numeral ring with black Arabic numerals. The center of the dial is white and shows a world time zone map with raised polished brass finished continents. The map rotates to give the time throughout the world. An acrylic crystal covers the dial, and a full felt bottom protects your desk or tabletop. Quartz, alarm movement includes battery. Size: Height 6-3/4" Width 5-1/2" Depth 1-3/4"
The Bulova B2258 Wyndmere World Time Desk Clock has a ebony zebra wood veneer pattern wood case. The face of the clock has brushed stainless steel corners and a spun and brushed finish world-time dial with major city markings. The black chapter ring has Roman numerals to mark the time. The clear seconds disk has a airplane rotating around dial. Requires one (AA) battery, not included. One year warranty and Free Shipping. 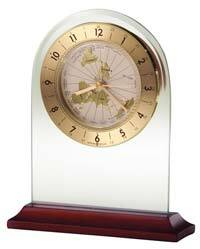 Size : H: 9", W: 7.75", D: 3.5"
Desk clock incorporating two clocks for dual timezone ease as well as a thermometer. Includes an area for smart phones, charging cords, as well as a pen and pencil holder. 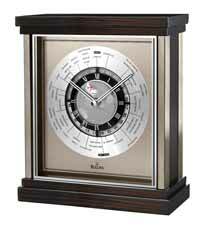 Features aluminum base and top, wood veneer, sunray bezel, and ebony clock dials with silver chapter rings. Includes a custom silver brushed ball point pen. Silver engraving plate included for personalization. Requires (2) LR43 batteries, included. One Year Warranty and Free Shipping. 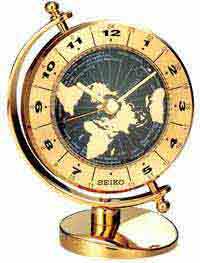 Size: H: 3.5" W: 8.75" D: 1.5"
Seiko World time clock in a heavy, solid brass case with a gimballed casing to adjust the viewing angle. World time bezel, representing 24 time zones. 1 AA battery included. Size: Height 5", Width 4", Depth 2 1/2".